Sivaluaq Jerry "Bucket" Lieb tells a customer the story behind a design on one of his pieces at the Cama-i Dance Festival at Bethel Regional High School on March 30, 2019. This year’s Cama-i theme was “Together We Dance As One.” The unifying message inspired artist Sivaluaq Jerry "Bucket" Lieb to design the festival’s spirit mask around the story of how people gave up fighting to dance and sing. Lieb told KYUK the story behind the image. 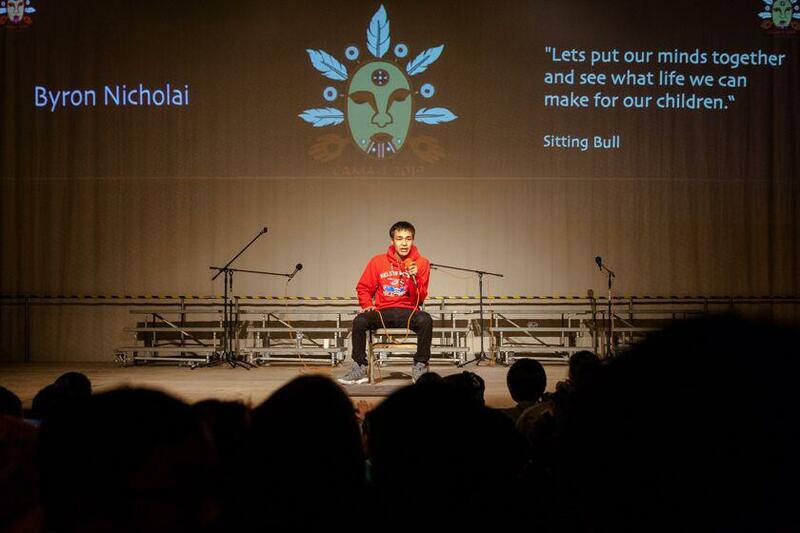 Toksook Bay singer and drummer Byron Nicolai performs on the Cama-i stage beneath the image of Auluturta, designed by Sivaluaq Jerry "Bucket" Lieb, at Bethel Regional High School on March 29, 2019. Lieb is a third-generation storyteller. He grew up neighbors with Bethel storyteller John Active, and first heard the story of Auluturta from John’s renowned storytelling mother, Maggie Lind. 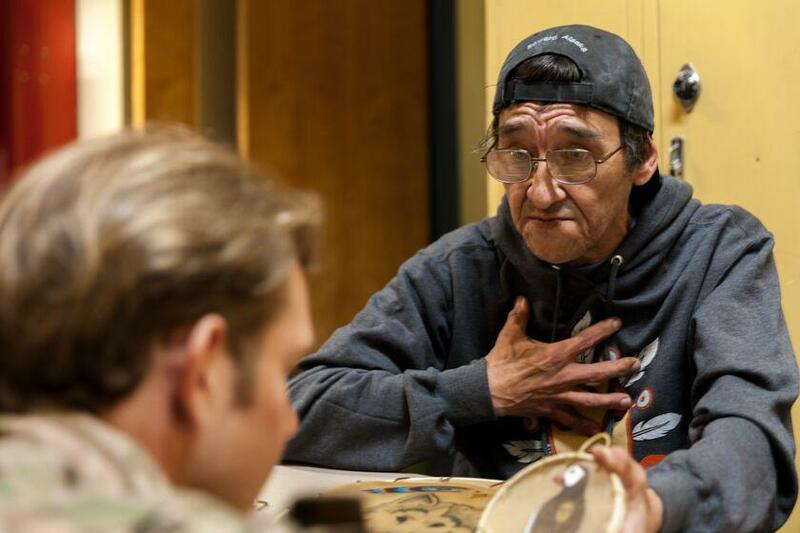 “She shared the story of Auluturta to remind me to pray,” he remembered. Lieb says that old stories like Auluturta’s can be hard to believe. The story of Auluturta starts during a time of warring over food. Auluturta was a great provider, but the animals were hiding and not giving themselves. The people were fighting and killing each other instead of making prayer. Auluturta was not a drummer. But one day a spirit man, who was his namesake, visited him and carried him through the earth’s thin crust. Auluturta taught his village the songs, but they didn’t have a drum. Then one day, a young man was walking through the wilderness and heard the village singing, the sound rising from the ground. Auluturta called the other villages together in a great gathering near what is now Bethel. Everyone who had been warring came. The spirit mask Lieb designed tells this story. The four dots on the chin represent the tribes from all four corners coming together. The four dots rising from his head represent the leaders of those tribes. The holes in the hands show that Auluturta was a healer, holding gateways to the spirit world. The eye of awareness sits on his forehead. The five feathers around the head are to carry prayers up to the Creator and represent the various types of creation, so that when a prayer is said with the mask, all creation is included. The two eyes carved into the mask are portholes, looking out into the spirit world. Lieb sees this year’s Cama-i as another gathering, where people from all over come together from all four corners to dance, to feast, to tease, to sing, for the good of all living things.